Directly related to the jud-, judic- unit. 1. To renounce, repudiate, reject, or to give up rights or allegiance on oath: Kevin said he would abjure his citizenship if his country continued with its policies of war instead of negotiating peaceful solutions to international problems. As their father, Tyrone felt it was necessary to abjure the habits of his children's excessive eating and sitting around playing computer games all the time instead of exercising. Pacifism abjures the use of deadly force. 2. To withdraw from or to recant publicly; to disclaim or to repudiate: Douglas abjured his life of bad eating and drinking habits when he determined to stop eating so much fried foods. Some of the prisoners abjured their past criminal acts during the religious service held in the prison on Sunday. 3. To formally reject rights, allegiances, etc. 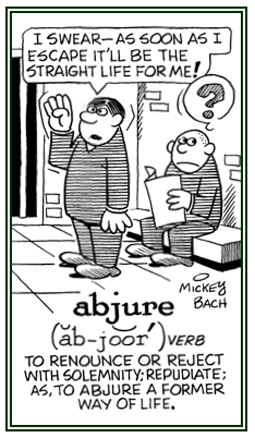 on oath; to renounce; to give up opinions publicly; to recant: The school principal wanted to be sure that Mildred abjured her false story about being tardy because her bus was late before she would be allowed to return to school. 4. To beg or to earnestly entreat: Right after the final decision as to the prisoner's guilt, he started to abjure the judge for mercy. Henry was abjuring his supervisor to give him another chance to complete the job which he failed to do on time. 5. 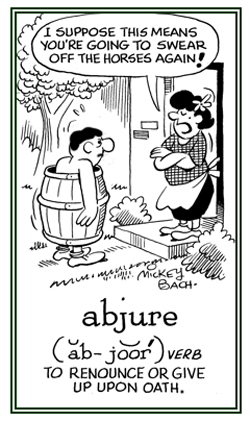 Etymology: from Latin abjurare, "to swear to, to confirm, or to deny by an oath"; from ab-, "away" + jurare, "to swear"; from jus, juris, "law". © ALL rights are reserved. 1. Someone who formally rejects or disavows a formerly held belief, usually under pressure: Joan became an abjurer when she was forced by a Medieval court of inquiry to give up her religious beliefs. 2. Anyone who implies a firm and final rejecting or abandoning of a former belief or position, often made under oath: The two abjurers, Steven and Edward, met with the media to explain their joint decision to abandon their previously held political commitments. 1. The solemn repudiation, abandonment, or withdrawal of an oath; often the renunciation of citizenship or some other right or privilege: The abjuration of Vera's citizenship in the country where she was born made it possible for her to become a citizen in the new country. Anthony's abjuration to the nation's government was that he swore to leave the country and to never return. 2. Denials, disavowals, or renunciations under oath: In common ecclesiastical language abjuration is restricted to the renunciation of heresy made by the penitent heretic on the occasion of his reconciliation with the Catholic Church. The many adjurations of the alleged witch convinced the clergy that she was sincere and penitent. 3. An earnest appeal, entreaty, or pleading to someone to do something: Bernhardt made an adjuration to his boss for an increase in salary. © ALL rights are reserved. 1. Earnestly or solemnly entreating; such as, in adjuratory terms. 2. Containing a solemn charge or command. 1. To command or to charge solemnly, often under oath or penalty: The judge adjured the defendant to answer truthfully. Professor Karl decided to adjure his students to prepare themselves for the final examination. Judge Herman did indeed adjure the witness, Erik Rolland, that he had better answer all questions truthfully during the trial or he would be held legally accountable. 2. To appeal to earnestly: Jim's mother adjured him to finish his term paper before the end of the weekend. Holly's doctor adjures her to go to the special therapist, or if she doesn't, she will suffer greater pain in her back. 3. To entreat or to request earnestly: The pianist was adjuring the members of the orchestra to come to one more rehearsal before the evening of the performance. 4. 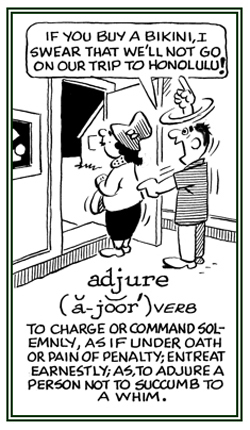 Etymology: from Latin adjurare, "to confirm by an oath", "to swear to"; from ad-, "to" + jurare, "to swear". © ALL rights are reserved. Translation: "We dare defend or maintain our rights." State motto of Alabama, U.S.A. This may be calling attention to the state's dedication to protecting its rights against infringement by the federal government. 1. To perform illusions and magic tricks that require agile hand movements, usually for entertainment: Troy, the magician, conjured a rabbit out of his hat. 2. To call upon or to order a supposed supernatural force or being by reciting a spell: Sharon looked into her glass ball, repeated the special phrase, and conjured up the spirit of her old grandmother and asked her for advice. 3. 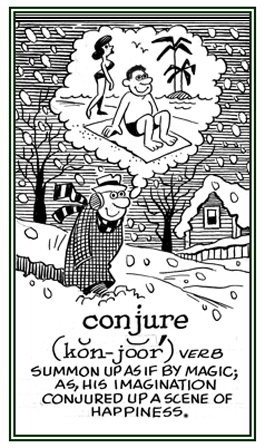 To change or influence something by reciting a spell or invocation: Roy listened to Anna's dilemma and tried to conjure her troubles away with a unique enchantment he had heard from his aunt. 4. To cause something to appear: Although the poor woman had no money, she managed to conjure up a meal of soup and vegetables for her hungry children. 5. Etymologically from Latin conjurare; literally, "to swear together, to conspire". © ALL rights are reserved. 1. An entertainer who performs tricks involving manual agility and the illusion of magic. 2. A magician, or someone who summons supposed supernatural forces or beings. 3. 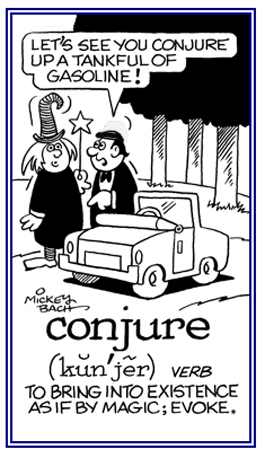 A person who conjures spirits or practices magic; magician. 4. Someone who practices legerdemain; a juggler. 1. 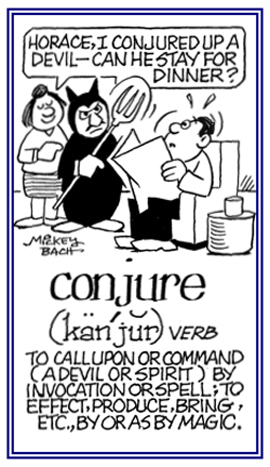 Variant spelling of conjurer. 2. Someone who performs magic tricks; a magician. 3. A sorcerer or sorceress. Body of law or a compilation of laws; or the assembled laws, of a nation, state, etc. : The collected laws of a nation, state, or city are its corpus iuris. Church law is corpus iuris canonici while civil law is corpus iuris civilis. 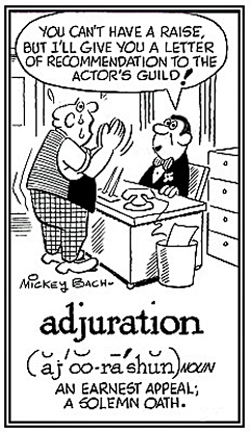 Sanctioned or according to law; legally: The congress passed an end to de jure segregation. The head of the government is trying to create a de jure state with one party in charge. Conforming to a law: "The country was recognizing the new government and it will soon be recognized de jure by all of the world's governments." Fiat iustitia, or justitia, ruat caelum. This maxim promotes the conception that the law must be followed precisely (blindly), regardless of any extenuating circumstances including finding out that the convicted person is innocent. It is apparently based on a situation presented by Seneca, "The Younger" (Lucius Annaeus Seneca, c. 4 B.C.-A.D. 65), who tells us about a man who was supposed to be hanged for murder, but he was sent by the executioner to a government official by the name of Piso because the purported victim appeared in public alive. Piso would not change the sentence of death. Instead, he ordered all three men to be hanged: the convicted criminal because the sentence had been passed, the executioner because he was derelict in his duty by not going ahead with the execution, and the assumed victim because he was considered the cause of the death of other two innocent men.